Thank you for your interest in Primary Graffiti’s Year-Round Homework packet! This has been my home learning method for several years. I’m pleasantly surprised by how effective the home learning as been for students with limited resources and low parent involvement. Parents have been receptive of meaningful home learning which is an extension of our daily lessons and common core standards! Each Monday will be a focus on math, pulled directly from common core standards. Tuesday will dive into reading standards, often breaking down components of the standard through multiple weeks. Wednesday's focus will be national science standards. Thursday will rotate between common core standards for language arts and writing genres. With school starting in various months, I prepared this packet with two start dates in mind: August and September. My district returns from break the third week of August. I typically assign a home based project the first two weeks to help get to know the kids. I won’t begin my homework until the start of the following month. The months are set up with 5 weeks. There will be times when extra days are provided. Communicate with your parents on how to handle the additional work. These additional days can be assigned for practiced or omitted. 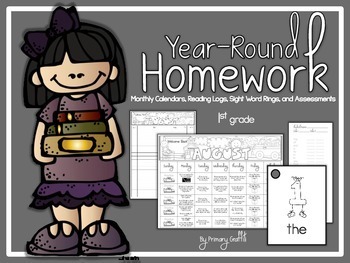 The format is to ensure calendars are an effective product for your classroom each year! Summer months are included for year-round students or for additional practice to prevent regression. 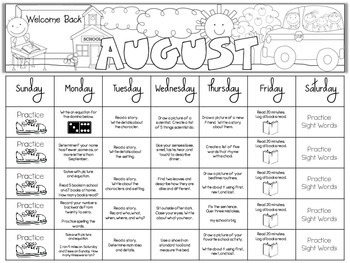 The calendars include 9 months of core instruction on first grade, 1 month of step up to second grade standards, and 2 months of engaging activities for the summer months. Each month, students cut apart their new sight words in class. Each child is given 25 words. 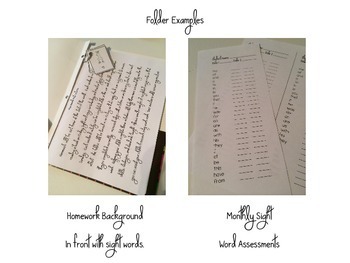 The first month of homework, the kids will be given a ring for their sight words. The following months, I have the kids cut out their words and place them in a baggie. I punch the cards with a hole before sending them home to add to their sight word ring from the previous months. I do not provide a ring each month. For struggling students, I’ve provided an alphabet, colors, and numbers words. 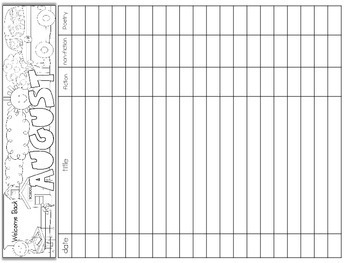 You will find an assessment checklist for each word and a class profile for each word list at the end of this packet. Year-round homework for second grade coming this summer! Keywords: common core, homework, reading, writing, math, science, skills, sight words, standards.